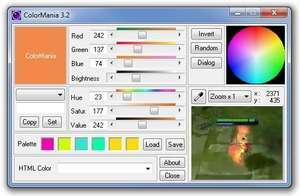 ColorMania is a free small tool which can be quite useful for web developers and other digital artists; it provides an easy way to grab color values from the screen. The utility itself allows you to select colors from the screen and find out its RGB value or hex code for usage in web pages (HTML), Delphi, VB, among others. It also provides HSL, CMY and CMYK values. ColorMania uses a magnifying glass to zoom in to specific areas. For security reasons, you should also check out the ColorMania download at LO4D.com which includes virus and malware tests. Additional screenshots of this application download may be available, too.